In a town, a temple was being built near a banyan tree. All kinds of workers; like mason, laborers, carpenters, ironsmiths, etc. were working at the construction site. On the banyan tree, there lived a gang of monkeys. Every day, when the workers were out for lunch break; all the monkeys used to storm the site and played with things lying there. During one of the lunch breaks, the monkeys were creating a ruckus at the site as usual. A monkey was playing with a huge log of wood. The wood was half cut and the carpenter had stuck a wedge in the slit. The monkey was curious to know about the wedge. He tried to pull off that wedge to kill his curiosity. 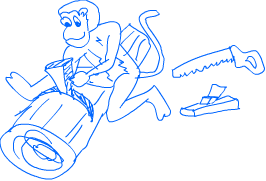 After much effort, the monkey was successful in pulling off that wedge. But while doing so, his lower body got stuck in the slit in the wooden log. The monkey had to suffer long hours of excruciating pain and finally he died.